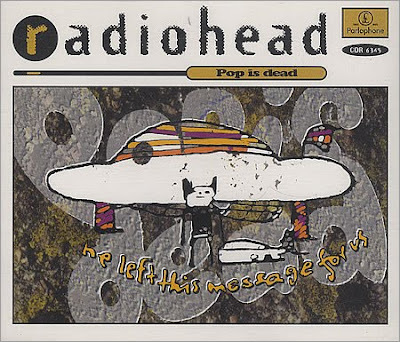 Radiohead's "Pop is Dead," the band's first single, is probably its least well known song. Released some time in May of 1993 (some sources say May 10, 1993, seventeen years ago today), it hit stores just a few short months after the release of the band's debut album, Pablo Honey. As a non-album single dwarfed by the success of their mega-hit "Creep," the song is little remembered today, especially since the band appears to have permanently retired it from its set list. B-sides on the original "Pop is Dead" single included "Banana Co. (Acoustic)" and live versions of "Creep" and "Ripcord." You can see the video for the song here (and wonder how the band depicted therein could have ever written the stellar "Paranoid Android" just a few years later). Bound for Pablo Honey, this song was actually left off the album. Thom describes it as "a king of epitaph to 1992. Hence the lines, 'Pop is dead/long live pop/Died an ugly death by back catalogue.'" Band members seem to concur that this is a very weak track, deserving of the scathing reviews it received. 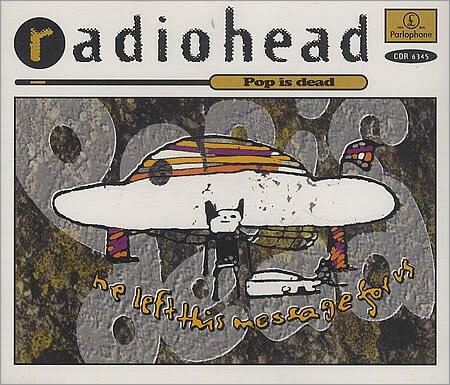 "Pop Is Dead" is the second single released by Radiohead. It is the only Radiohead single not available on one of their albums. Released only several months after their debut single "Creep" and their debut album Pablo Honey, the song also hit before "Creep" had begun its slow and surprising ascent up the pop charts worldwide. "Pop Is Dead" reached number 42 on the UK Singles Chart in May 1993. Although not strictly a B-side, "Pop is Dead" was actually the band's final single of 1993. However, it deserves to be treated as a B-side for the simple reason that its' not very good. This, presumably, is why the track was left off Pablo Honey in the first place. 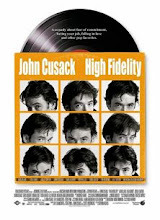 Comedy, however ironic, only works when the underlying music is top class, and the fundamentally routine rocker tries to be a little to clever for its own good. For the longest time, the original "Pop is Dead" CD single remained out of print, making the song incredibly difficult to locate in that format. (It also appeared as a b-side on the similarly difficult to find "Stop Whispering" single, which I believe is also now out of print.). If a collector wanted to own the original CD single, eBay was one of his or her options, and a high price was expected. A live version of the song did appear on the 1995 Live at the Astoria videocassette release, which documented the band's May 27, 1994 concert at that venue. (Lead singer Thom Yorke introduced the song at that show by noting that it was "dedicated to members of the press, as it always has been."). That concert was later released on DVD in 2005. However, unlike several of the band's other EPs and singles, the original "Pop is Dead" single remained out of print. However, when the Collector's Edition of Pablo Honey was released in 2009, its second disc, a collection of b-sides and rarities, included "Pop is Dead." But like most things, it wasn't really worth the wait.